Hispanic consumers prefer at-home activities versus more costly out-of-home options, according to a report from Mintel. 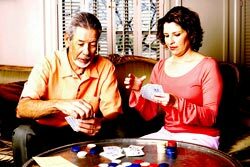 The research shows that cost is the primary driver in how Hispanics decide to enjoy their leisure time. “Watching a movie on TV or reading a book or magazine is taking a front seat to more financially driven experiences, such as dining out or going to live sporting events,” says Adam Jacobson, multicultural analyst at Chicago-based Mintel. Thirty-six percent of Hispanics say they watch a movie on TV more than three times per week. About one-third of respondents would rather curl up with a good book or magazine in Spanish in the same time frame. Forty percent of the surveyed Hispanics say they enjoy dining out, but only do so one to three times per month. Thirty-four percent of Hispanics in the U.S. say they will attend a sporting event, and 30% plan to attend a street festival in the next three months. In addition to eating out, the most common form of out-of-home entertainment among Hispanic adults is a trip to the movies. More than half (53%) of respondents saw a feature film in a theater at least once in the last year, and 42% plan to go to the movies in the next three months. Mintel research suggests that cinemas could benefit from offering a variety of concession items that appeal to Hispanics or providing a family discount program, as Hispanics tend to have larger families than non-Hispanics. When not out and about town, you can expect to find Hispanics enjoying online entertainment. Spending time on social networking sites such as Facebook is the most common weekly activity among 77% of Mintel respondents. Over a third (36%) of Hispanic adults visit their social networking Web sites at least three times a day and they can do this easily thanks to online access from mobile devices. Sixty-five percent of online Hispanics surveyed say they have a smartphone, and 31% have an iPad or similar type of tablet device. 1 comment about "Hispanics Prefer At-Home Entertainment". Merri Grace McLeroy from Integrated Marketing Strategies LLC, August 17, 2012 at 11:51 a.m. This comes as no surprise as Hispanics are more family oriented. It also supports the necessity for businesses to buy into psychographic and behavioral modeling in order to provide products, services and messages that are relevant to diverse audiences.